I'd already noticed the Knit and Stitch TV ads because I watch TV whilst knitting, so I was very pleased to be asked to review the first two issues and eagerly awaited my parcel. In the interests of transparency I should point out I was given the issues free. Knit and stitch is a weekly magazine which aims to teach knitting, crochet, crewel work, tapestry and felting. 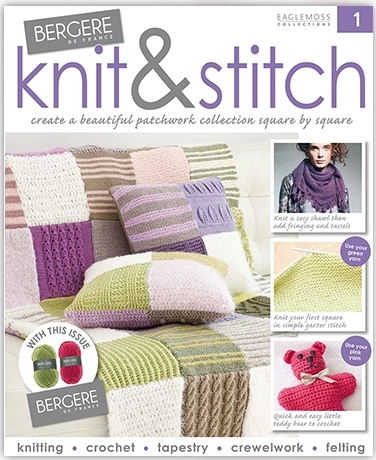 Each issue includes Bergere de France yarn, and each week there are instructions for a new square to add to your patchwork throw and cushion. There are also other patterns for accessories, clothing and toys and useful hints and tips. The first tapestry square is simple garter stitch but the picture on the cover shows other more complex designs as you week by week become more competent and confident. I decided to focus on crochet as I am self-taught and have never yet followed a pattern: I'm a "pick up the hook and go" crocheter. Issue 1 has a DVD which has taught me how to decrease more effectively (thank you!) though I would have liked the producer to leave off the background music. (Side note: for those of us used to youtube tutorials it's quite disconcerting in that the demonstrator is silent. The voice track is dubbed, presumably because it is available in other languages too.) There are also "know how" pages if you prefer to learn stitches and techniques from the printed page rather than a screen. Also in issue 1: knitting patterns for a shawl and a child's sweater and a crewel work cushion. Anyway - to work! I decided to crochet the teddy from the pattern in issue 1. 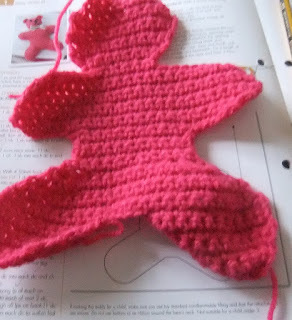 Because I'm self-taught, and because I'd been crocheting quite some time before discovering that American and English crochet terms do not mean the same (!) 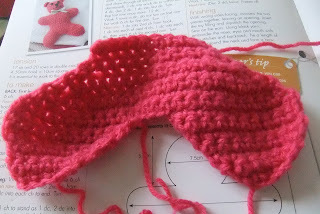 I've never had any success with following crochet patterns. In this case though I had the know-how page and the DVD to keep me on track. Nonetheless I got confused regularly, and had to undo my work several times. After my years of doing my own thing it wasn't really that likely that I'd sit down and meekly follow every instruction, was it? 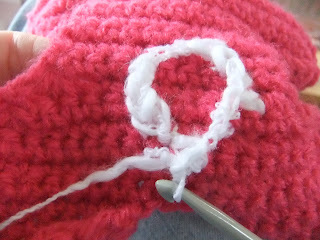 I'm a big fan of avoiding sewing on, it's a potential area of weakness especially if you are making for a small person. For this reason, I suggest embroidering the features on the face BEFORE sewing the front and back together, this way you can tie off/sew in the ends much more securely. Similarly, when my rabbit demanded a fluffy tail, I crocheted it directly to his bottom rather than sew it on later. I hope this is helping you to see how you can take a published pattern as your starting point and make it your own? I think he's rather lovely, and will be giving him away to one lucky reader - stop back tomorrow to hear about issue 2, see the bunny's face and find out how to enter! haha, love your bunny-teddy-rabbit-bear, I've not seen the TV ads, so wasn't aware of the magazine. Ideal for beginners, I guess. I got stuck with trying to follow a pesky American pattern once, but I find now its easier to follow the diagrams rather than the words. I have to say I have been sucked in to subscribing and have been left very disappointed thus far. My first eagerly awaited delivery was missing issue 2 and 3, and therefore crochet hook. Issues 4-7 came stuffed in a bag sans the free needles and any of the pomp associated with the on shelf issue 1. K&S haven't been very helpful in the matter. I can't contact you direct as you are anonymous, hope you see this.